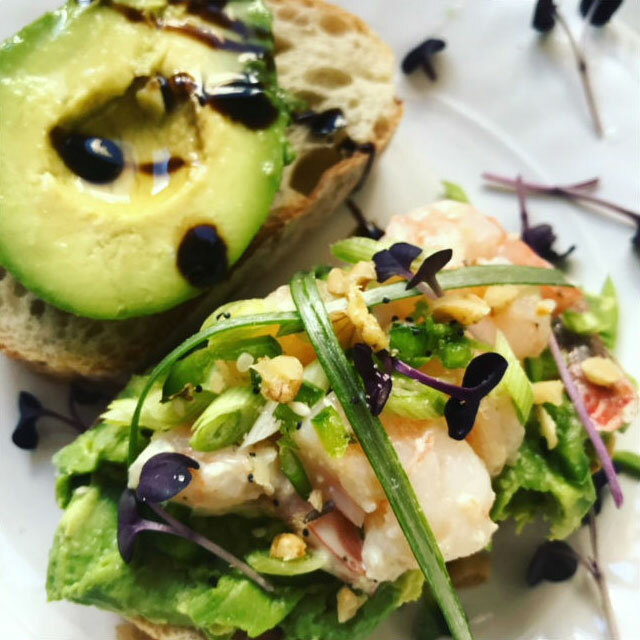 Prawn Salad on Avocado Toast Recipe - Nisbets Australia Blog - Industry news, trends, recipes and more! If not already done, clean prawns: de-vein, remove tail, and steam or boil. Chop prawns and set aside. Wash herbs and dry, reserve for garnish. Combine all sauce ingredients: mayo, mustard, red wine vinegar, salt and pepper. Add chopped prawns. Stir to combine. Set aside. Brush baguette slices with 1 teaspoon of extra virgin olive oil. Toast under broiler for 2-4 minutes. Combine avocado, olive oil and fresh lemon. Garnish with red chili pepper flakes and fresh herbs. Make this dish gluten-free by using jicama slices or gluten-free bread instead of a French baguette. Garnish with truffle vinegar to add a rich favor. Twist this dish by using a ceviche style recipe instead of steamed prawns. Let raw prawns soak in the juice of a lemon and lime for 30 minutes prior to serving. Spice things up by adding chopped cherry peppers to the salad. Serve with a mixed green salad, and garnish with edible flowers.